Kurt Hoddinott is the senior manager of investments at General Mills, overseeing the company's pension, savings plan and post-retiree health care assets. Hoddinott has worked at General Mills for 18 years. He is experienced with equity, private equity, fixed income, stable value, real estate and energy portfolios. Hoddinott holds an MBA from The University of Chicago Booth School of Business and a BBA from The University of Wisconsin-Madison. He has also earned the Chartered Financial Analyst designation. 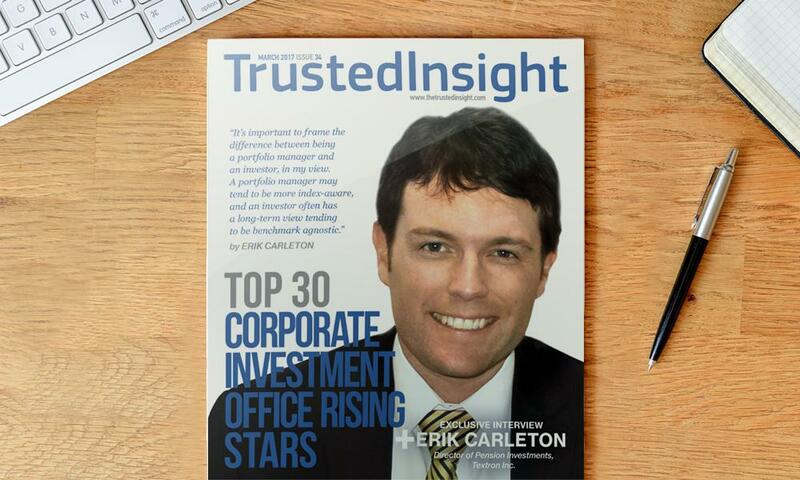 Hoddinott was recently named on Trusted Insight’s Top 30 Corporate Investment Office Rising Stars. He graciously spoke with Trusted Insight on March 21, 2017. The following interview has been edited and condensed. Trusted Insight: What does a typical day look like for you? Kurt Hoddinott: We manage the benefit plans for General Mills, so about $9.5 billion between the DB, DC and post-retiree health care plans. As a corporate staff, we're a lean team. We manage both the operational and investment responsibilities for those plans, including a fair amount of blocking and tackling. For the DC plans, we make sure our participants have liquidity to trade, and we make sure the returns of our funds are reasonable so our participants can trade at a fair NAV. On the DB side, it's making sure our asset allocations are where we want them to be, given the current market and positioning. We make sure we have liquidity for our capital calls, and for monthly pension payments. After all that is done, we focus on the investment side of what things to ensure we achieve the goal of the plan assets. Trusted Insight: You were a sales financial analyst at General Mills, worked your way up through a number of roles, earned your MBA and then a spot on the investment team for the retirement plan. How did those experiences shape your approach to your current position? Kurt Hoddinott: In terms of your career, as a young person, it's very difficult to script how everything's going to play out. As you pointed out, I started out in the finance rotation program at General Mills back in '99. It was only through an informational meeting with the then-CIO that led me to this career path. At the time, she noticed that I had a real estate background from Wisconsin, and she said "We have a real assets program that's begging for some good in-depth investment research, and you'd be a good fit. Would you consider an 18-month rotation in our group?" That was in 2003. That 18 month rotation has now turned into a career. I've progressed through the group for the past 14 years and experienced things across the portfolio. It's been an interesting ride. As far as what shaped me, there's been a lot of market events over that time, not to mention the credit crisis. Then there's also the people that you work with. It's a team approach. I've had the benefit of working with and for some great people over my time here, each bringing a work style that I've benefitted from. Trusted Insight: What’s the investment team structure, decision-making process and governance structure like? How do you go from an investment idea all the way to final execution and implementation in the portfolio? Kurt Hoddinott: Our team consists of three analysts, three managers and a CIO -- fairly small. That's important. We are generally aligned by asset class, but we are way too small to work in a silo. When you talk about how you go from idea all the way to implementation, it really starts with saying, "What are the things that we want to work on over the course of the next year that we think will yield some interesting ideas?" It kind of works from that grass-roots idea generation stage. Then we examine it individually, and as a team, to essentially establish a basis for interest. After that, it's the hard work of doing the diligence on both the ideas and the manager implementation. Our committee has been great, and they're very open to new ideas. They're very understanding that some of these things just don't turn on a dime, that you have to be patient and that risk premiums take time to harvest and may sometimes involve a little bit of short-term pain. Trusted Insight: Where are you looking for private market opportunities? Kurt Hoddinott: It's tough sledding out in the private equity markets, with buyouts being at a historically high purchase price multiples. Venture is a little bit more interesting in that respect with pre-money valuations down, but even there they’re still high. However, with venture, access is always the issue, especially in a size that will move the needle at the plan level. You want to make sure that you're spending time on things that are going to make a meaningful difference. I think it's going to boil down to being very selective in private markets and adding value around the edges in co-investments. The future is going to require hard work. It's going to be squeezing out alpha. It's going to be portfolio rebalancing and being tactical when opportunities arise. There's no free lunch right now in the alternative space, or really anywhere in the market. Trusted Insight: What differentiates the General Mills investment office from some of your other corporate pension fund peers? Kurt Hoddinott: We try to be humble in that respect; there's a lot of plans out there with talented people as well. In the end, we’re staying true to our investment philosophy of simplicity, value-orientation, with eye on overall risk. We've always said "Look, we want to make sure we understand what we own, and make sure that we're performing all the operational, day-to-day activities flawlessly.” That has proven to be successful for us. We've been in long bonds since the 1970s. So, we've benefitted greatly with the secular decline in interest rates. My predecessors had the early foresight to understand the relationship between long bonds and the pension liability. That has been a large contributor to where we are now in terms of a very well-funded plan, and likely a differentiator. Over the past decade, corporate plans have found religion and really embraced the idea of LDI, its impact on the portfolio and income statement, and the overall purpose of the plan assets. I think that’s something that's come into focus. It's truly a focus for us. The purpose of the plan assets is to pay pension payments. It really is saying "Here’s what I expect to pay out in pension payments, and how do I do that at a risk level that's agreeable to my committee?" In addition to being early adopters of long bonds, we have been successful in alternatives in the past and that has proven to be beneficial, especially in energy. Lastly, we've been diligent to rebalance even when that's been painful at times. We did that through the credit crisis. We also allow ourselves to be tactical when large opportunities arise. For example, being overweight equities after the credit crisis and being overweight to deep value as tech was exploding. I think those things ultimately make a difference. Trusted Insight: What major trends are affecting or impacting how you invest right now? Kurt Hoddinott: I talked about the purpose of plan assets. We're laser-focused on that. For us, it's all about trying to tease out what really is the risk tolerance of our committee, vis-a-vis where our plan assets are now and what’s required to deliver our pension payments. That isn't something that is easily identifiable. It requires continued dialogue. Saying "Here's how we’re currently positioned and the risk level we’re signed up for versus what we absolutely need to take. Do we all feel good about this?" We've had a very long, albeit slow, recovery here, and I think there's the danger of forgetting that black swan events can occur. Long story to your question, I think it's really about effective ways to capture the risk tolerance of your committee. Trusted Insight: What's your broad outlook across the markets in the near- and medium-term? How does that play into your portfolio strategy in meeting the risk-return profile that you can afford? Kurt Hoddinott: We focus on and feel good about the performance of the plans on a long-term basis. We've generated very well-funded plans. We've generated strong returns, 50 basis points above our benchmark, net of fees over the long term. As far as the outlook, we don't have a crystal ball. I talked about how I thought that things were fully valued in the alternative space. The equity space is just as challenging. The U.S. has a forward P/E close to 17. There’s slightly more value in non-U.S. Developed Markets and Emerging Markets, but certainly not without risk there as well. Fixed income, as you know, are at historically low yields. So, there's a real possibility of an asymmetric return profile there. There's no easy answer here. In this environment, for us, it's about squeezing out alpha, rebalancing the portfolio and the blocking and tackling that adds value. I think I saw a study that it adds 40 basis points to underlying performance by just simply rebalancing. That's important when there isn’t anything that’s a glaring opportunity. That said, I've done this long enough to know that opportunities do arise and you need to be willing to be tactical when they do. I think the short answer to your question is returns will be hard to come by going forward, given current valuations. It comes down to squeezing out alpha, rebalancing the portfolio and being tactical when the opportunity presents itself. Trusted Insight: What else should I know about you, General Mills’ investment office, or about corporate pension fund investing? Kurt Hoddinott: I'm not a silo unto myself. Hopefully I’ve emphasized that throughout our conversation. It takes a team to do this well, and I’m on a very good one. General Mills has had a long history of smart people investing the plan assets, and the well-funded nature of the plans is a testament to that. It’s all about making sure that we're maintaining the core tenets of our philosophy and making sure that we're passing those along to future generations so that we can continue to deliver exceptional performance for our participants. To learn more about foundation investing, view the complete list of Top 30 Corporate Investment Office Rising Stars. You can view our full catalogue of interviews with institutional investors here.